The Timex-Sinclair 1500 is basicaly a Sinclair ZX-81 in a ZX Spectrum case with 16 KB RAM. Timex marketed the Sinclair computers on the North American market. The ZX-81 was sold as the TS-1000 (with 2 KB RAM instead of 1 KB of the original model) and the ZX Spectrum as the forth-coming TS-2000 (which remained a prototype). As the sales of the TS-1000 were dangerously falling, Timex produced a mix between the ZX-81 and the ZX Spectrum: the TS-1500. The goal was to correct the weaknesses of the TS-1000: too small memory and awfull keyboard. It's in fact just a ZX-81 with the 16 KB RAM expansion built inside a Spectrum style case. But the original black case turned silver for the TS-1500. To prove that it is exactly the Spectrum case re-used here, there is still the speaker grid underneath the system, whereas the TS-1500 has no sound feature! However there are minor cosmetic changes: the "sinclair" encarved logo on top of the case is replaced by a fake grid... In fact, this plastic case was the TS-2000 one (which was never produced), reused here for the TS-1500. The chicklet keyboard is also an improvement (really?) over the flat membrane keyboard of the ZX-81. The keys layout is exactly the same as the ZX Spectrum. You can even use keyboard membranes of the Spectrum 48KB to replace the existing one if it breaks. Apart from that it remains a TS-1000. The connectors are the same (RF TV ouput, tape recorder, expansion bus) and the Basic is still the Sinclair Basic. 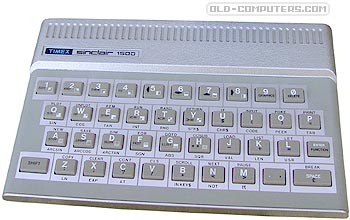 A 16k RAM expansion (the same as the one sold for the TS-1000) can be used to reach 32 KB RAM. 1. The ROM was updated to check for 16 KB memory and correct faults in the TS 1000 version (which corrected faults in the ZX81 version). 2. You could only add a 16 KB RAM pack (1016). To use any larger 3rd party RAM pack from the TS1000/ZX81 family you need to modify the motherboard. 3. Circuitry was added to allow you to choose which channel to display, 2 or 3, when you turned on the system by holding down the "3" key on the keyboard. 4. The motherboard is a complete redesign with 16 KB onboard and the ULA (Undefined Logic Array) was surface mounted and not socketed. Despite its funky look, the TS-1500 did not sell well either. In 1983, who wanted to buy a ZX-81 disguised whereas you could offer yourself a splendid Commodore 64 for a few more bucks! Special thanks to Eileen O'Neill who donated us this computer ! see more TIMEX / SINCLAIR 1500 Ebay auctions !